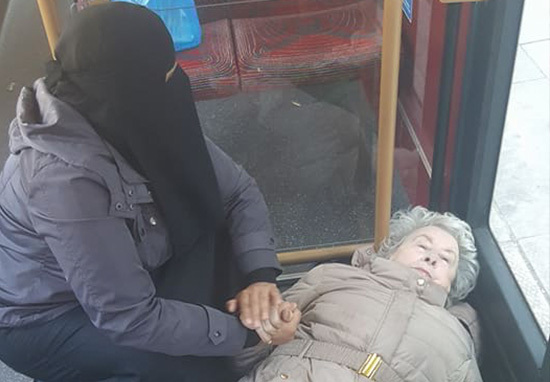 A photo of a veiled Muslim woman helping an injured pensioner on a bus has gone viral, with users declaring it ‘the real Islam’. The woman, wearing a niqab covering her face, held the hand of the 84-year-old lady who struck her head. The Muslim woman held the lady’s hand for 20 minutes until the ambulance arrived, and Hamza O Bakri, who took the photo, said ‘the media won’t show you the real Muslims, only show fake 1s [sic]’. The post has received over 41k reactions on Facebook and over 49k shares. 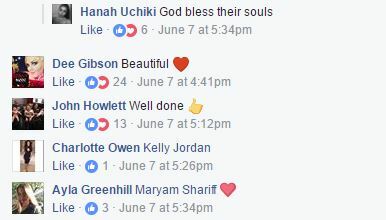 Many people have praised the woman, re-iterating the point that ‘the terrorists are not Muslim’. Lots of people were also very puzzled about how the old woman ‘got her head stuck between the door and metal pole’ on the EL1 bus from Ilford to Barking. Figures realeased by London Mayor Sadiq Khan shows there has been an increase in Islamophobic incidents than after the 2015 Paris attack. Hate crime is up to 54 incidents a day versus a daily average of 38 for 2017.